All of us at Toyota of El Cajon wish you a happy and safe Labor Day Weekend with family, friends and festivities. The Toyota Labor Day Countdown is on right now and is offering you 0% APR on 11 of our models. Including Venza, Avalon, RAV4, Corolla, Highlander, Tundra, Sienna, Sequoia, Prius, Prius Plug–in, and for the first time ever the sale also includes America’s best selling car, Camry. 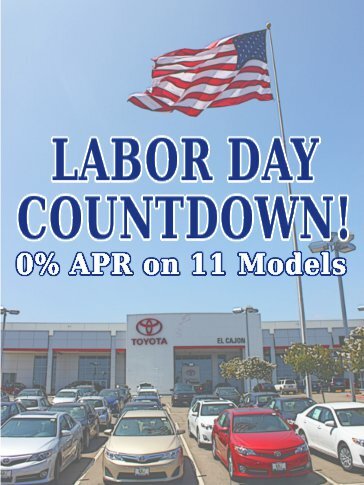 Our Labor Day Countdown specials only lasts until Sept 4th, so hurry down to Toyota of El Cajon THIS weekend!